To set up buckets for your plan’s tasks, on the Board, select Add new bucket, enter a name for the bucket. Don't see Add new bucket? You might have the Board grouped by something else. 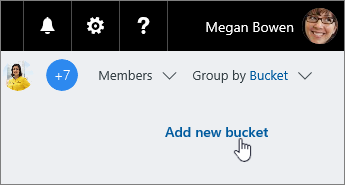 Select Group by near the top right, and choose Buckets. Tip: Want to change a bucket name? Select a bucket name to make changes. You can even rename the To Do bucket to something that you might find more useful! 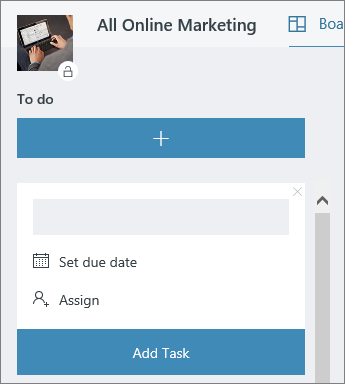 Once you've created a bucket, you can drag tasks into the bucket to start getting organized. 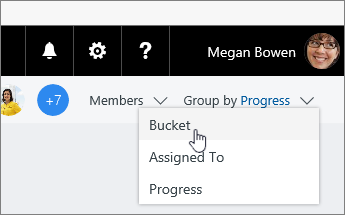 You can also select the plus sign (+) below the bucket name to add a new task to that bucket. Enter the name of the task and choose Add task. You can change the order of how buckets appear on the screen by dragging the title of a bucket to a new position. If you need more ways to organize your work, you might find using colored labels helpful. 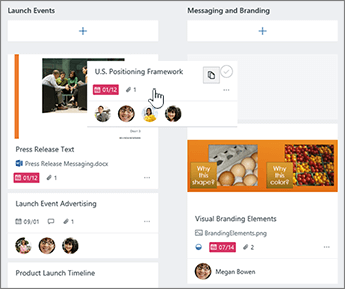 You can flag tasks with multiple colored labels to help you see, at a glance, which tasks have certain things in common.